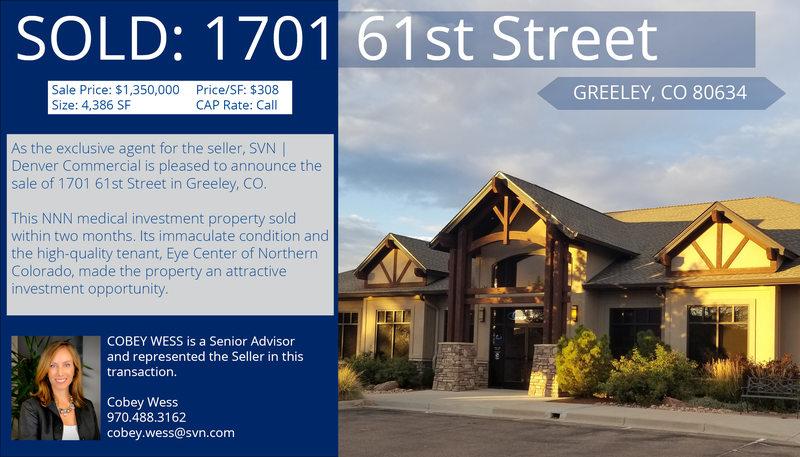 GREELEY, CO, November 14, 2018, SVN | Denver Commercial, (Northern Colorado Division) one of Colorado’s top producing real estate investment brokerage firms, is pleased to announce the sale of a single, NNN, medical investment property located at 1701 61st Ave, Greeley, CO 80634. The property, which sold for $1,350,000, was listed and sold within two months. “We received a tremendous amount of interest for this solid investment opportunity. The immaculate condition of the building along with a high quality tenant, Eye Center of Northern Colorado, made this an attractive investment opportunity that gathered attention rapidly. The Seller and Buyer are both very pleased with the outcome.” said Cobey Wess, a Senior Advisor with SVN and the Seller’s Agent in this transaction.